It was the first German aircraft to be built in any significant numbers after the Second World War: a classic aircraft of the type “Pützer Elster B” (D-ELKY) has been extensively restored with the assistance of the Porsche Museum and will now have the mission of representing the museum at airshows as its “flying ambassador”. There are close historic ties between the Porsche Museum and the “Elster” (magpie): the Porsche aeroengine Type 678 was tested in this aircraft type at the end of the 1950s. The museum of Dr. Ing. h.c. F. Porsche AG, Stuttgart, now has plans to nurture its tradition not only on land, but also in the air. After extensive restoration lasting three years under Project Manager and owner Jürgen Gassebner, a “Pützer Elster B” has been restored to its former splendour. The restorers invested over 1,000 hours in giving the flying machine a thorough overhaul. Particular attention was paid to reconditioning original parts as thoroughly as possible, to minimise the need for new parts. As well as the engine, the electronic equipment on board – known as the avionics – was replaced. The wooden aircraft’s interior was also given full restoration treatment and the airframe, in other words the wings and fuselage, were expertly overhauled. The “Elster” also sports a modern, fresh design: the design concept created by renowned Stuttgart designer Wolfgang Seidl gives a nod to classic Porsche racing car design of the 1950s and 1960s in adopting the traditional Porsche colours red, white and grey. Both the wings and the fuselage itself are emblazoned with the Porsche Museum logo. The classic aircraft designed by Alfons Pützer KG in 1957 was initially supplied to the German Air Force and the German Army’s aviation sports groups. Only a few specimens found their way directly into private ownership. Pilots in both the military and in flying clubs praised the high-wing aircraft for its forgiving aerodynamic properties and consequently favoured its use for basic training and as a glider tow plane. Today, only 15 remaining “Elsters”, as they are referred to for short by the flying fraternity, are registered with the Federal Aviation Agency and approved for flying (ten B and five C models). Those who are familiar with it describe the “Pützer Elster B” as the best “three-handed” aircraft in the world. Unlike many other specimens, the “Elster” has neither nose gear controlled by the side rudder pedals nor foot pedals for the two drum brakes in the main undercarriage. 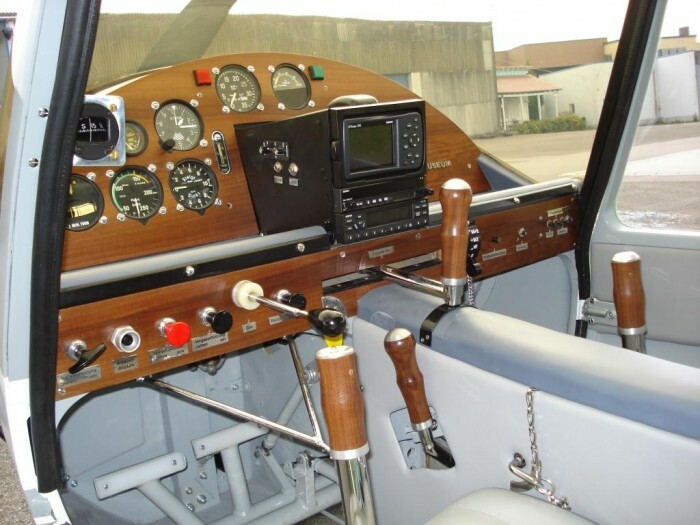 Instead the pilot, seated centrally in front of the instrument panel, uses a huge lever to steer the nose wheel, directly translating turning action into steering like the tiller of a boat. If the lever is pulled to the left, the aircraft rolls to the right, and vice versa. There is another lever for the brakes on the side of the bulkhead between the pilot and passenger, with the result that even taxiing to the runway requires considerable skill. 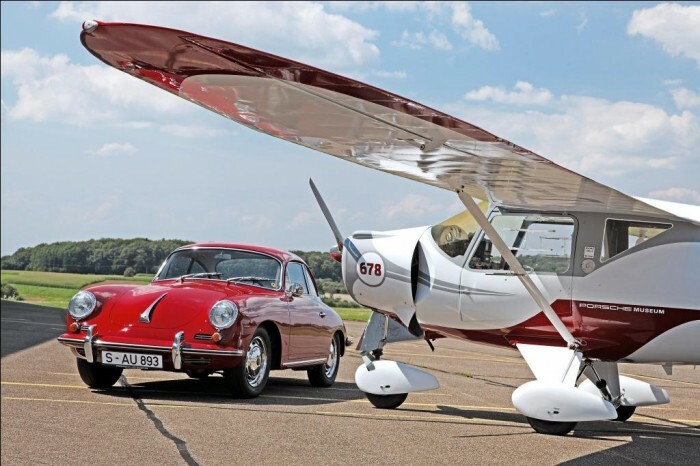 The “Elster B” with the registration D-ELKY from 1963 also has close historic ties with the Porsche brand: the Porsche aeroengine Type 678/3 was tested in this aircraft type from 1957. This flat-four engine was based on the power unit of the Porsche 356. The forerunner of the “Elster” aircraft type was the Doppelraab, which the aircraft manufacturer Alfons Pützer initially used as the basis for developing the Motorraab power glider together with Fritz Raab, then some time later the “Elster A” prototype which incorporated the Doppelraab wings. It was originally planned as a purely German aircraft and was already powered by a 52 hp (38 kW) Porsche engine Type 678/3. In response to calls for increased flying performance the “Elster B” was subsequently fitted with the 95 hp (70 kW) Rolls-Royce Continental engine Type C-90 14 F.
At its presentation in 1957 Porsche stressed the fact that the new aeroengine Type 678 satisfied the inspection requirements of the German Research Institute for Aviation in accordance with the “British Civil Airworthiness Requirements” and was therefore internationally approved. Based on a successful test rig endurance test of 150 hours, in other words six days and six hours, the interval between general overhauls was fixed at 600 operating hours. The 1.6-litre flat-four engine badged as the Type 678/3 with 52 hp (38 kW) take-off output and 50 hp (37 kW) continuous output featured dry-sump lubrication and two tilt-proof inclined-nozzle starting carburettors that permitted at least aerobatics figures such as rolls, looping and banked turns. Depending on aircraft type, the engine equipped with high-voltage magnetic dual ignition had a modest fuel consumption of between 12.0 and 16.5 litres per hour. Even so long ago, Porsche was already addressing the issue of air traffic noise by fitting the engine with an effective silencer. The “Pützer Elster B”, with its wingspan of 13.22 metres, will now have the mission of representing the Porsche Museum at airshows as its “flying ambassador”. The museum is thus illustrating yet another facet of the engineering genius of company founder Ferdinand Porsche. Because over 100 years ago, the young Porsche successfully developed aeroengines as well as automotive engines.